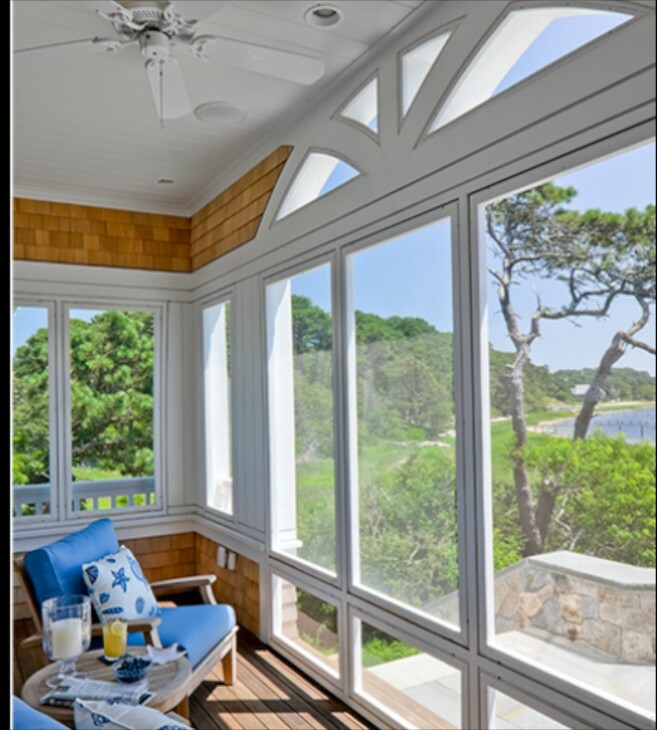 Back in May I featured the beautiful restoration of a shingle style home by Polhemus Savery DaSilva Architects Builders. If you missed A Fool’s Paradise, you can see it here. 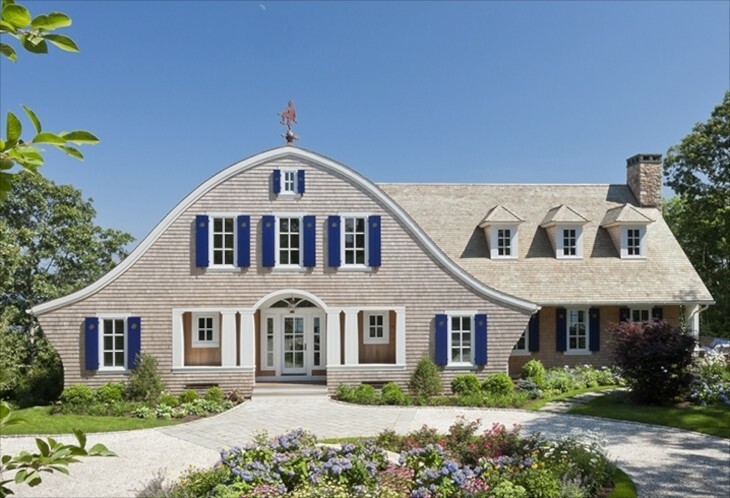 Today I am delighted to post on a new shingle style home by this same firm, built in Chatham,MA on Cape Cod. Beautifully integrated onto it’s sight, it was also on a House Tour that recently raised $68,000 for the local museum. With a flowing and very unique front facade, the house beckons you to want to see more. 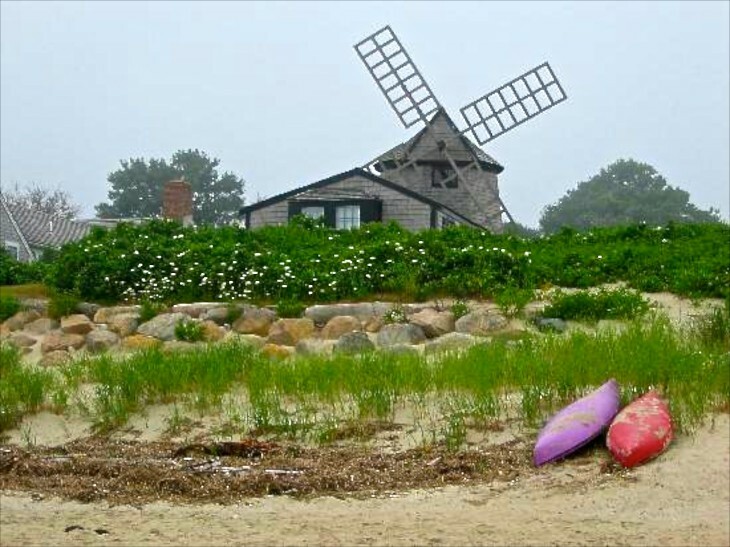 Once inside you will not be disappointed, with bright interiors and whimsical touches, these lucky owners have a wonderful setting on the Cape to now call home. Photographs are by Brian Vanden Brink. 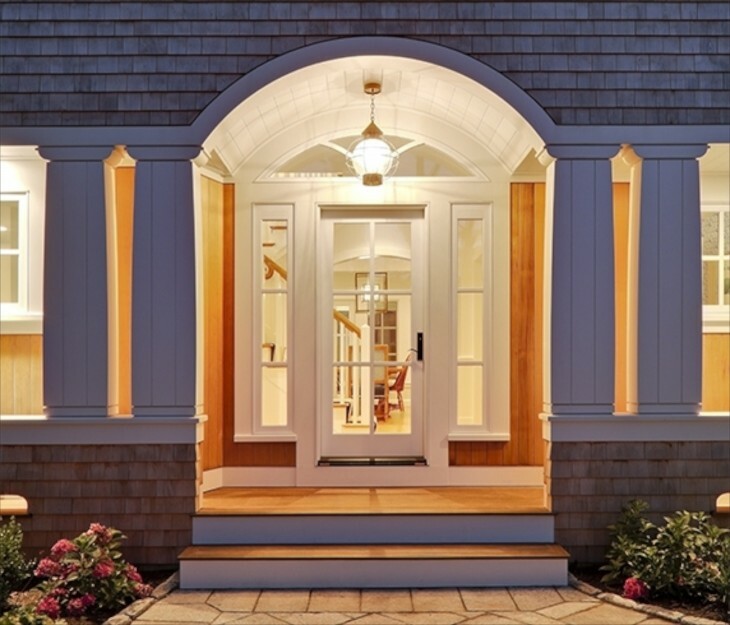 What a welcoming facade to a home on the water. 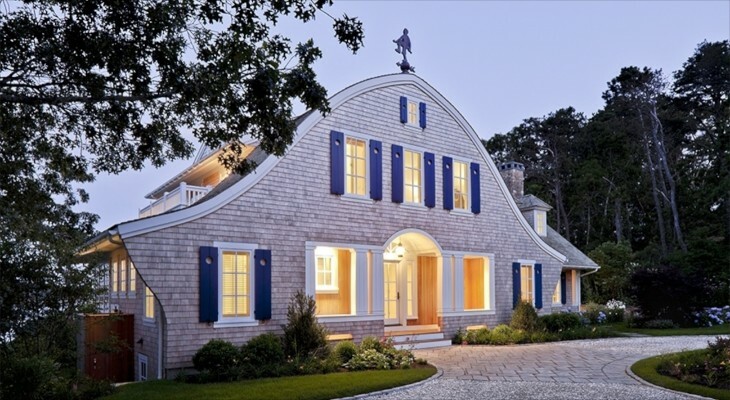 Shingle style and full of character. I think the bright blue shutters just make you feel happy. 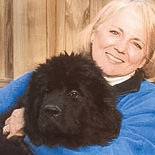 The home is located both on the water and in a neighborhood intertwined with a golf course. 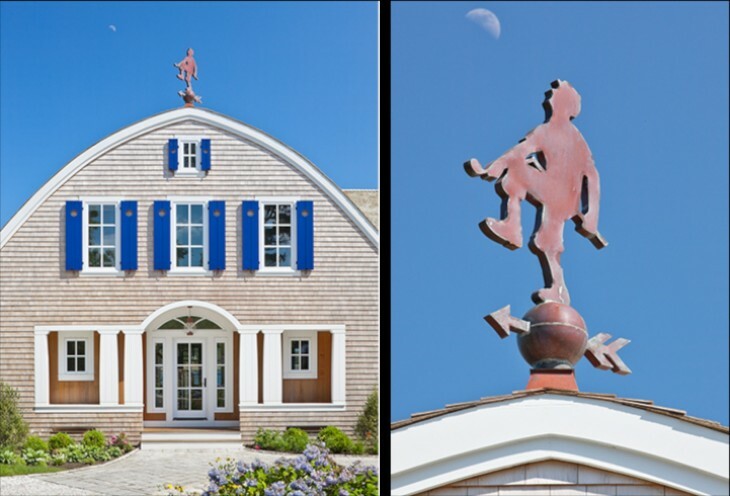 The weathervane shows a golfer breaking his club over his knee, and the bit of whimsy can be seen from those on teeing up on one of the holes. I love it when there are elements that connect to either the surrounding or to the owners or better yet, to both. I love barrel vaults and this shipped one, combined with the same treatment on the columns is beautiful. The home sits on an elevated site out of a flood zone, which also allows for enhanced views of the pond, bay and Atlantic ocean. 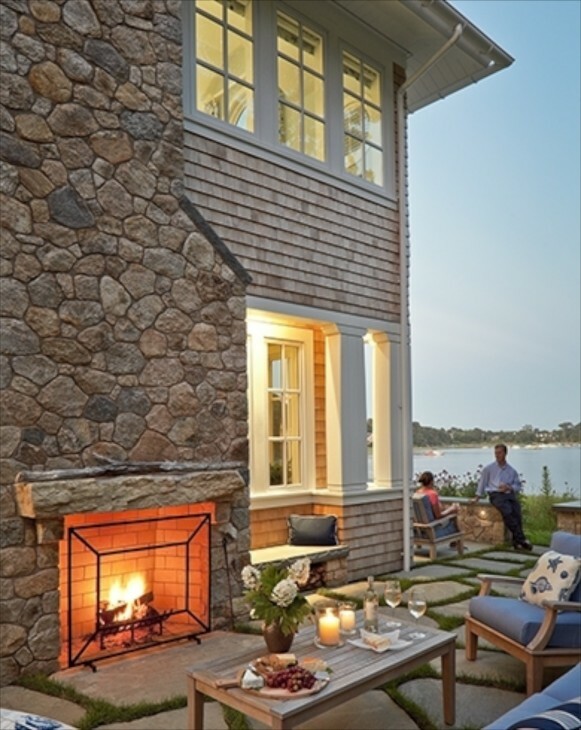 I really like that the builder used a piece of stone for the mantle in the outdoor fireplace. 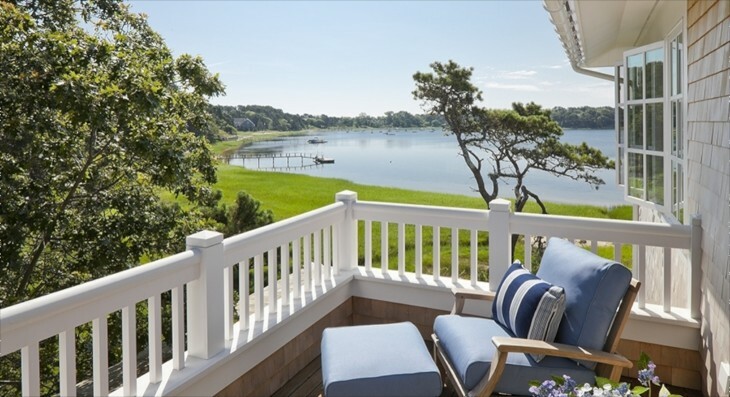 Great spot for entertaining, or just sitting and enjoying the breezes and water views. Originally there was an office, guest house and a main home right down on the beach which were apparently prone to constant flooding. They were removed, the house placed uphill to avoid flooding and the area where the original buildings were planted with native plants and grasses. The large covered porch flows onto a stone patio for additional outdoor space. 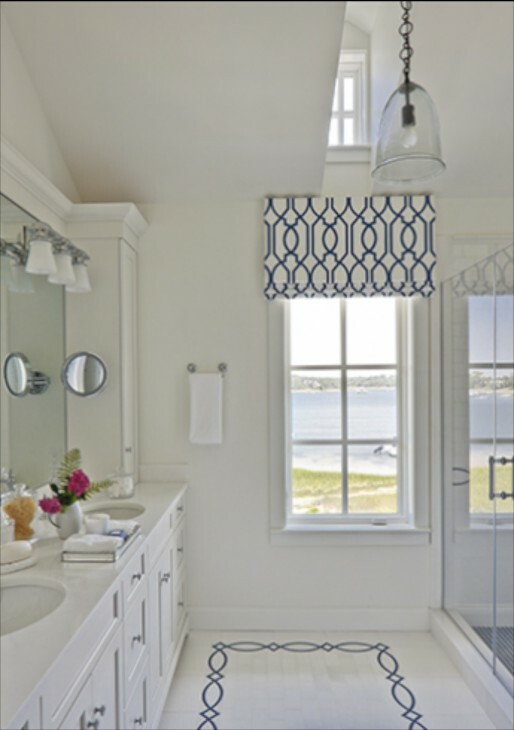 The blue from the shutters is repeated in the fabrics used on the outdoor furniture for a cohesive look, relating very much to the sky and water. 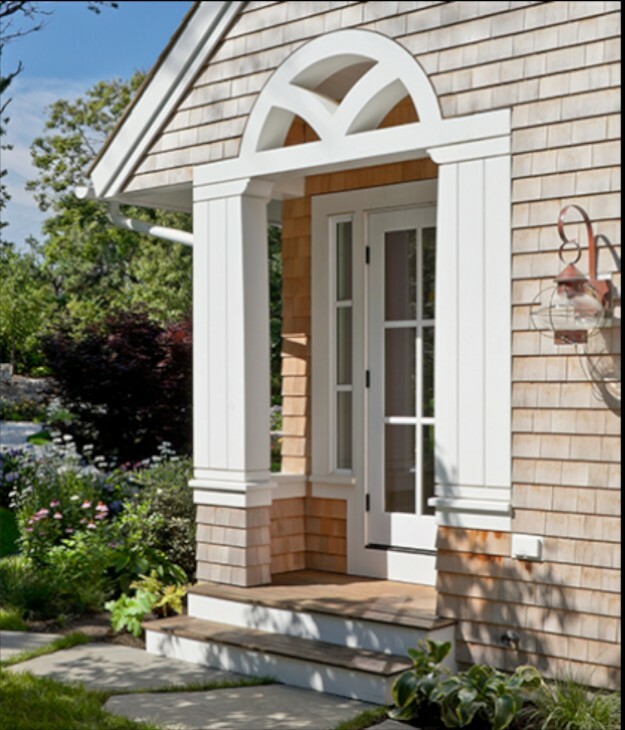 As in all the homes and projects this architect designs, the detail work makes such a difference, as shown on this side porch details. Although smaller, the details mimic the larger front entrance, with trim that mimics the barrel vault, and repeating with the same hefty wood columns. 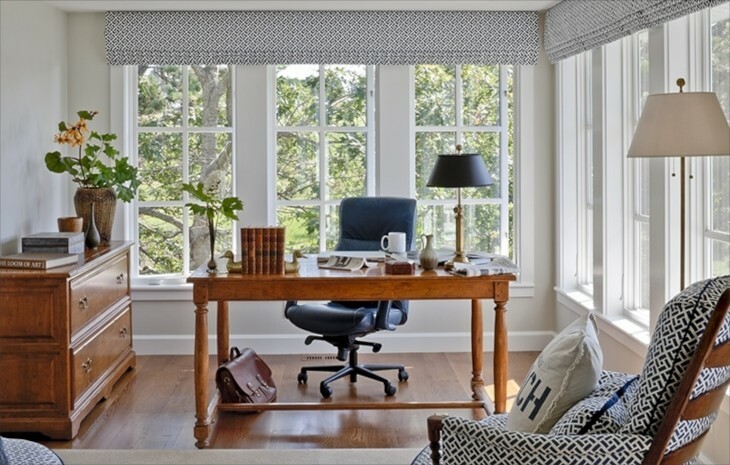 A smaller enclosed and screened porch for those blustery days. The dining room can be seen from the front door, and the views continuing straight ut to the water. To the right of the dining room is the kitchen and the family room. 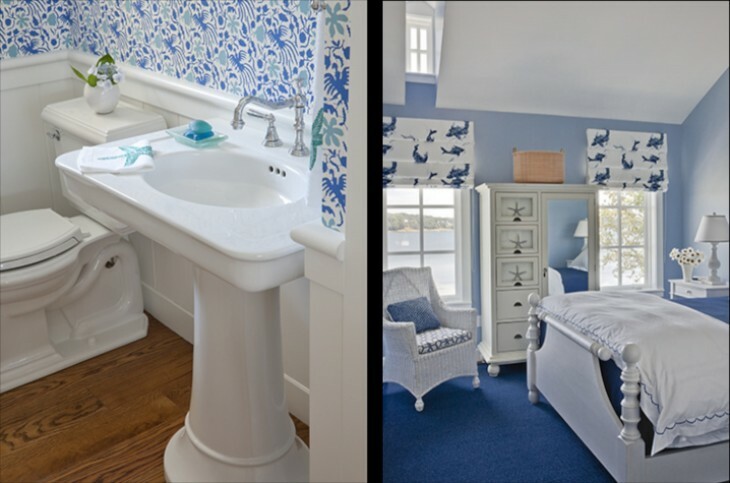 The coastal theme continues with blue used throughout the house, including on the generous sized island. 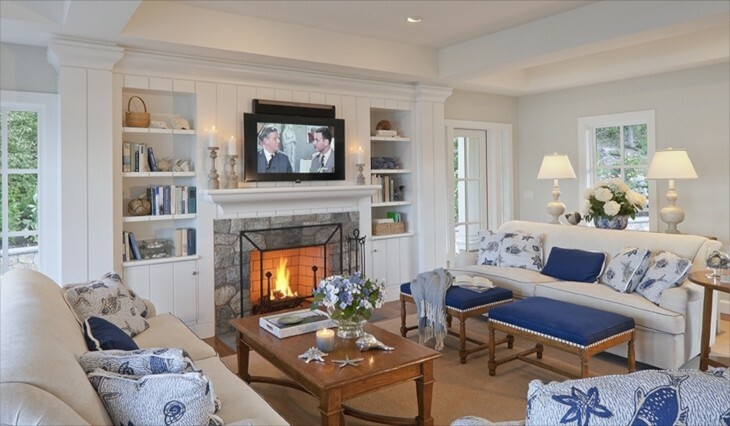 Such a bright yet serene family room. I am happy to see that the TV was placed in a spot where it can be viewed by anyone in the kitchen or the family room, and not “hidden” as many designers feel they have to do. Big screen TV’s are a part of our lives, and that is a lot of what families do in their family rooms, so to try and deny that is crazy IMHO. I sometimes miss having art over the mantle but I just find creative ways to use big art pieces in other ways. 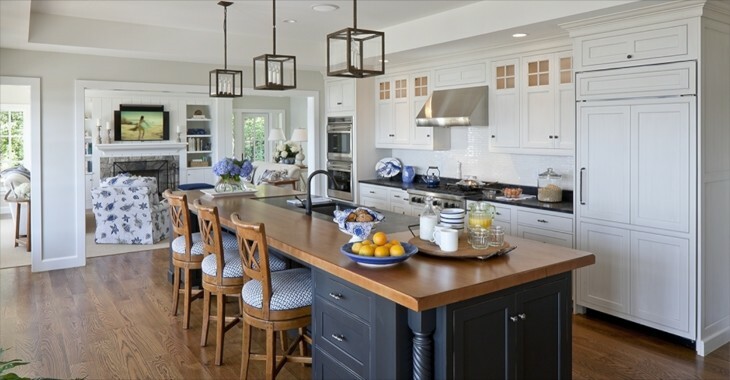 I love how the architects chose to use both a coffee table and beautiful dark blue fabric covered ottomans. The trim makes the blue pop. It is all about comfort in this room. 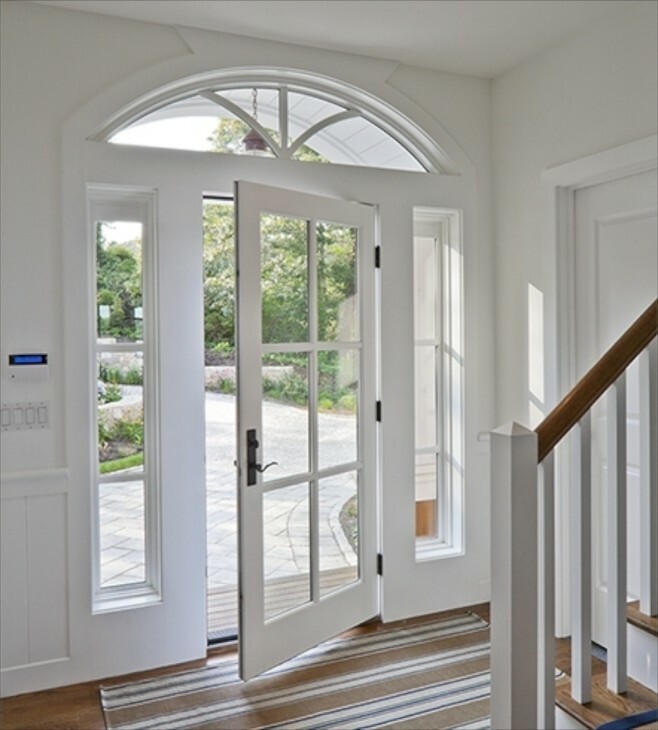 Bright front entrance, leads to an equally bright foyer. In the left photo is a window seat half way up the stairs. In the right photo, Taken from the bottom of the stairs, you can see the window seat as well as the dining room. 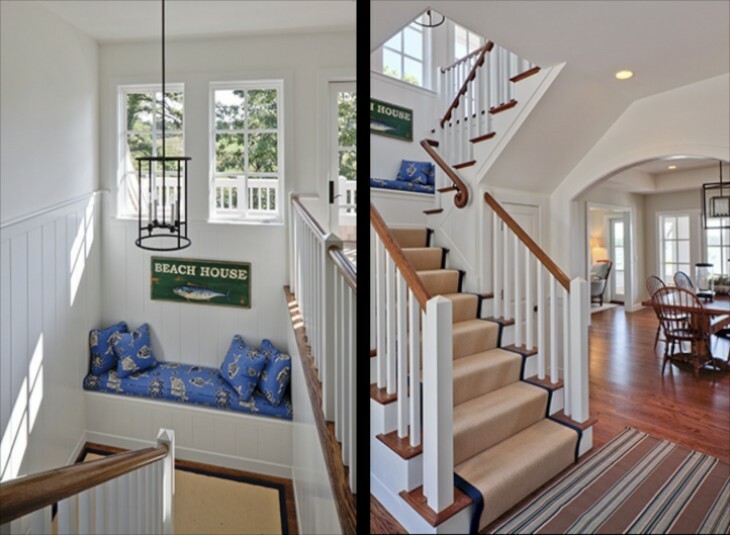 Sisal stair runners with trim running up the sides is so easy care and relates so well to the sand right outside the door. Wonderful mudroom with lots of storage and stone floors for easy upkeep when returning from the beach and swimming. To the left you can just see the stairs that lead to the basement, and straight ahead is a small study/office. The blue decor continues in this study. 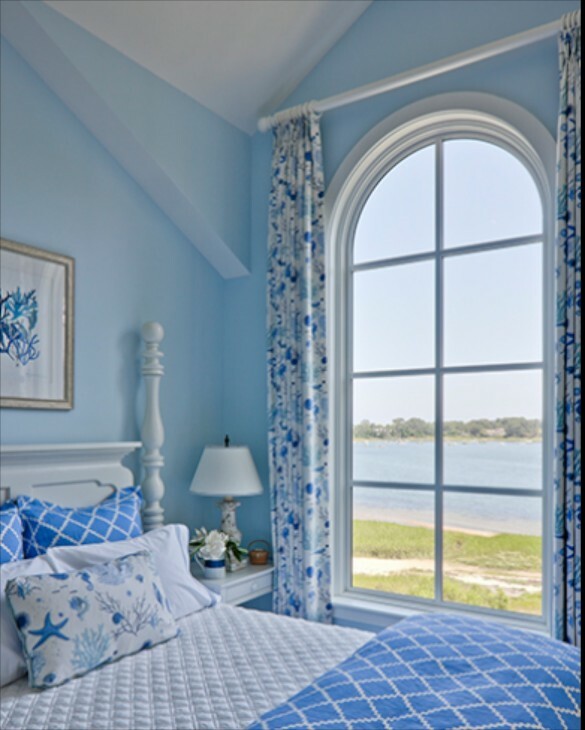 I would spend much of my daydreaming time staring out the window towards the water. And if I spin my chair around, a bit of a sylvan view. 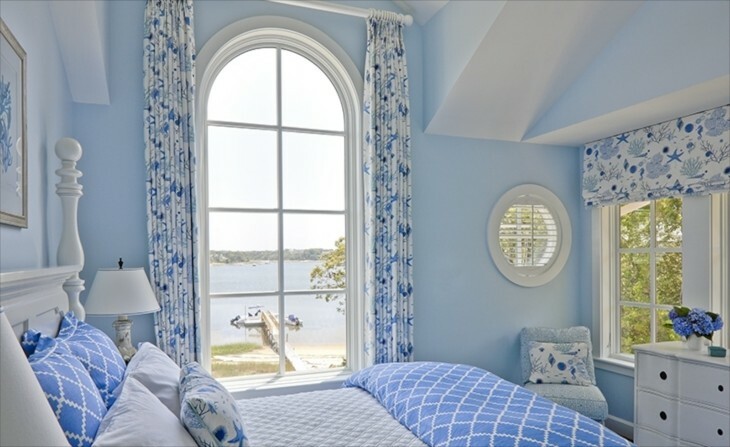 One of the bedrooms facing the water. 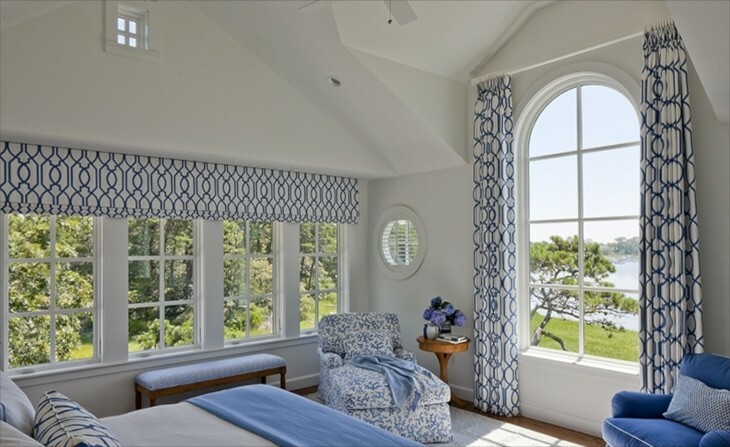 Various geometric and floral patterns present a cohesive look throughout the bedrooms, all done in blue and white. This one has white walls. This bedroom is the reverse of the one above, with blue walls, and floral drapery instead of a geometric , and on the bed more geometric. 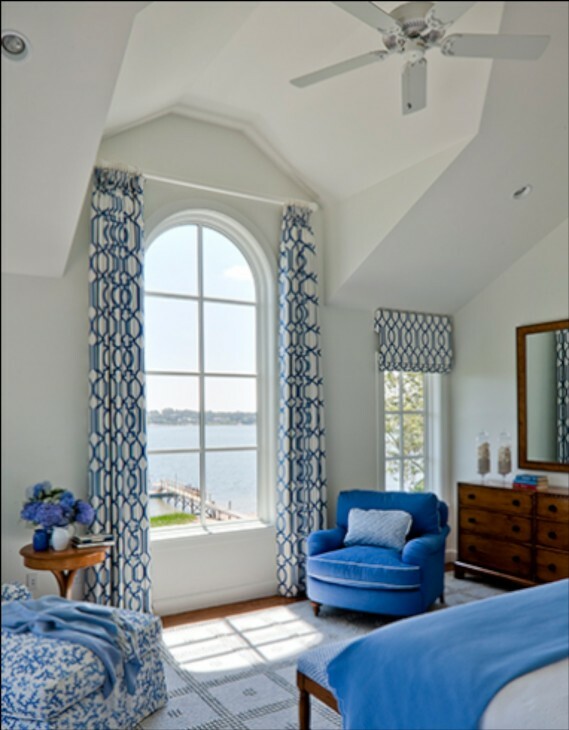 In this bedroom, back to white walls, but stained wood is more prevelant in the furniture, complimented by pops of bright blue solid colored fabrics as foil to the patterns. Another view of one of the bedrooms above, showing the mostly while furniture in contrast to the above.I love that the bedrooms are not huge, but cozy with tons of interested added by the round windows and the interesting ceilings created by the exterior dormers. From here you can make sure no one is leaving in the boat from the dock without you knowing about it! One of the bathrooms and another bedroom. Here we see both color on the walls and in a deep blue carpet. 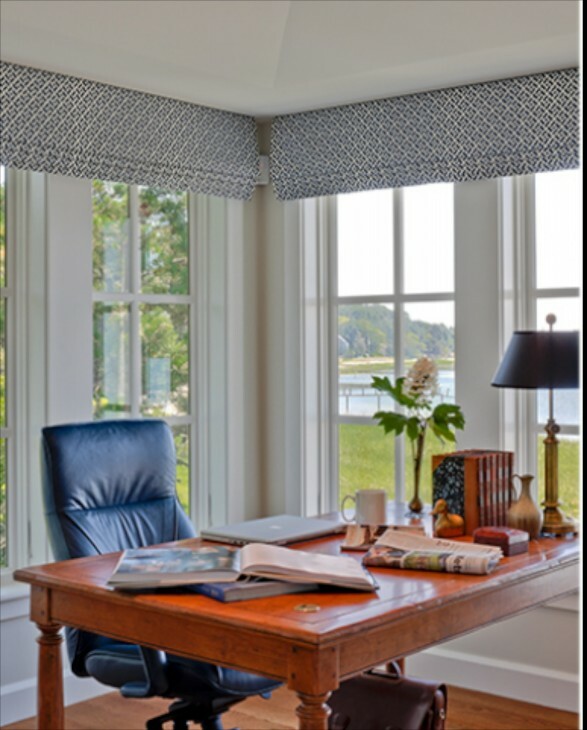 I love the whale fabric used for the Roman shades. The large basket atop the mirrored dresser adds a natural element. Adorable room. 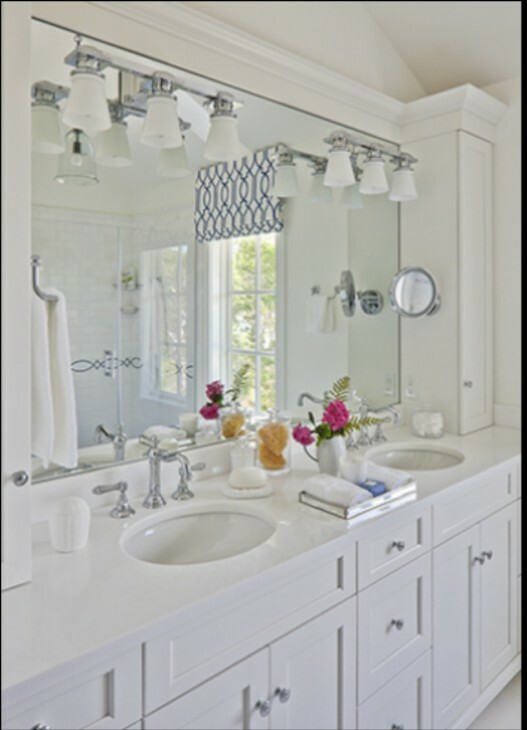 The master bath, all white, clean and crisp. And darn if it doesn’t also have a view. The amount of blue color brought in by the tile accent on the floor is perfect. A provate porch, probablu off one of the bedrooms. You can see that porch railing from the photo above on the right side of the house. 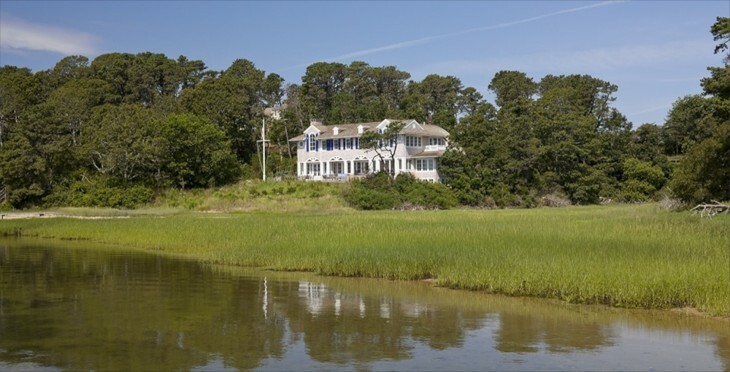 This view, from the water shows the wonderful symmetry with shuttered windows emphasizing a classical approach to shingle style. or to The Windmill on Pleasant Bay, in Chatham.